Burning the midnight oil yesterday, Reform Party council proceeded to bless the 38 pages of power agreement for the fresh union of three (aka «hesitation coalition», «spare govt», «the hapless three»). Arguing, and hard pressed. Today, like heavy lifting awaits councils of IRL and Soc Dems. Not easy for Reform last night, not easy for fellows today. But – the portfolios have been handed out and a great deal of the work accomplished. «Steadfastly forward. Keep the same course,» smirked a member of the party, former mayor of Tallinn, government minister and Riigikogu member, now a sailor Tõnis Palts as comment to Postimees. Emotions are the same in others glancing at the long pages: having toiled hard, it’s still rather vague. «The expectancy was whipped up, but what we miss is content,» claim the critics. To Postimees’ knowledge, for the time being it has not been considered to cover costs by income from a measure proposed by former finance minister Jürgen Ligi – the much-criticised move to demand declaration of deals exceeding €1,000 – though the reform was actually a notable and rare success: over its initial four months, €57m in taxes have been collected additionally. On the other hand, the agreement is said to still contain the equalisation of hotel VAT i.e. it will rise from 9 percent to 20. This is a measure more than questionable: perhaps, €25m will be yielded in a year, but the damage to enterprises is much bigger. That is, regarding competition – here, we are not competing among ourselves, but with other countries. Unavoidably, the measure will lift prices and will be hardest on accommodation establishments in periphery. As was to be expected, dividing the ministerial seats was a source of great confusion and passion, in the parties. Among Reform the least, perhaps, as the picture was rather clear. Largely, the same persons will carry on while changing portfolios, with the new-old faces of Kristen Michal and Arto Aas added. The latter will carry a brand new public administration portfolio. A former Andrus Ansip’s chief of staff and economic affairs committee head at Riigikogu, Mr Aas is not known as a figure too charismatic, but a man able to see the big public picture. A stir was naturally created by Jürgen Ligi emerging as new education minister. Not illogical though: at times a bit too sharp for the public, in his former job as finance minister he was a highly esteemed leader. By nature, he might resemble Jaak Aaviksoo – a forceful minister who fights for his domain. Meanwhile, due to the «liginovski» scandal, for Soc Dems Mr Ligi continues to be a red rag. Among squirrels, many were indignant at Anne Sulling unable to continue as foreign trade minister – the specialist who earned Estonia €400m for selling air i.e. pollution quotas, and lately opening Japanese market for Estonian daily products. In the new government, the job goes to Urve Palo. Concerning Ms Palo as well as Urmas Kruuse, getting rural life portfolio in the new government, those with experience regarding the former government fear they might not do well at EU summits and other international meetings – due to poor command of English. 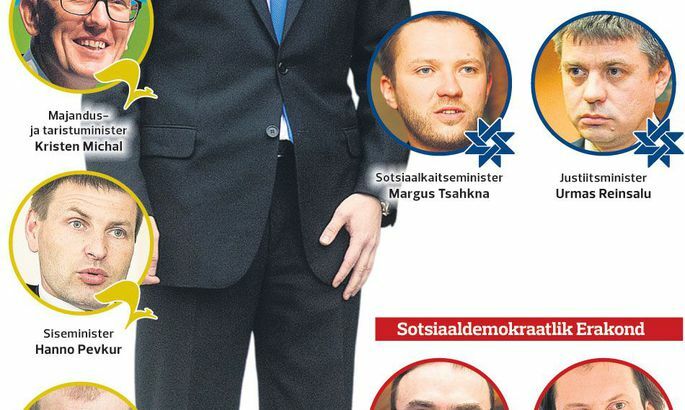 Soc Dems, desiring foreign ministry for Sven Mikser, lost out to Reform. It’s also work at Riigikogu for former ministers Andres Anvelt, Helmen Kütt, Ivari Padar, Jevgeni Ossinovski. Today at 5 pm, the Soc Dems council convenes with lots of people expected who are not at all satisfied with the text of neither the agreement nor portfolio distribution. «Tremendous tensions are written into the coalition, from the very start,» say some soc dems. With current Soc Dem secretary-general Indrek Saar rising to be culture minister, the party needs a new CEO. In smaller circles, yesterday, current vice mayor of Tartu Kajar Lember was being tossed around. Another party to elect a leader is IRL. Having assumed justice minister’s responsibility, Urmas Reinsalu has announced he is not running to be re-elected as IRL head. Meanwhile, logic dictates that party chairman sits alongside other ministers in cabinet, also closely linked to Riigikogu faction of own party. Thus, it might be either Marko Pomerants or Margus Tsahkna at IRL helm soon. At that, no party involved is excited and expectant about the new coalition.